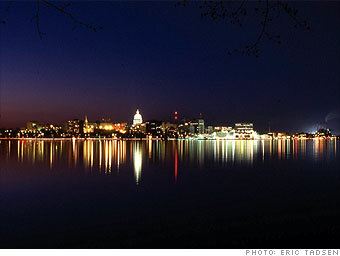 Madison's low unemployment and highly educated population help the city land consistently in the top ranks of "Best Places" lists. Convenient transportation and the generally temperate climate also don�t hurt. The University of Wisconsin-Madison has a Small Business Development Center, plus students and graduates for hire. An economic development initiative called Thrive is working to foster local growth in three target sectors: biotechnology, agriculture and health care. It's starting to pay off: The Madison region now has more than 250 biotech companies employing 10,000 workers, a 64% increase in local biotech jobs since 2000. Madison is renown for offering an excellent quality of life -- it's filled with art fairs and farmers markets, and offers outdoor enthusiasts abundant lakes, rivers and hiking trails. Home to Trek Bicycle, the largest bike manufacturer in the U.S., the Madison area is filled with so many cycling trails that city planners like to refer to the region as North America's Bike Capital. What do you think of Madison?